BABYLON or Egypt may have woven the first carpets or floor coverings, and China of course worked early in the same field. But Persia acquired the art quite independent of China, and well in the beginning of the long ago. Indeed, the Chinese industry practically ceased to exist many centuries back, and was transferred to northern Persia, where the history of this handicraft has its true beginning. From Persia all other countries have drawn their knowledge and inspiration, and however much they may have endeavoured to create and to evolve new figures and new designs, even the oldest examples of their art must concede something to Persian influence. The Turks, above all others, have shown themselves the most apt scholars, and indeed in many lines have improved upon their teachers. The choicest specimens of Turkish weave are as rubies to the other precious stones, rarer, more brilliant, and more costly than diamonds. Though not so closely woven as some of the Persians, they are wonderfully beautiful in artistic picturing and in their own Oriental splendour of colour and design. Such in particular are the antique Gheordez, as splendid in rich floods of light as the stained-glass windows of a cathedral. They are the finest woven and have the shortest nap of their class. These word pictures are in no way exaggerated, and only help to portray the glories of the old Gheordez, with their graceful hanging lamps, as wonderful as Aladdin’s, in a vista between pillars of chalcedony or onyx. 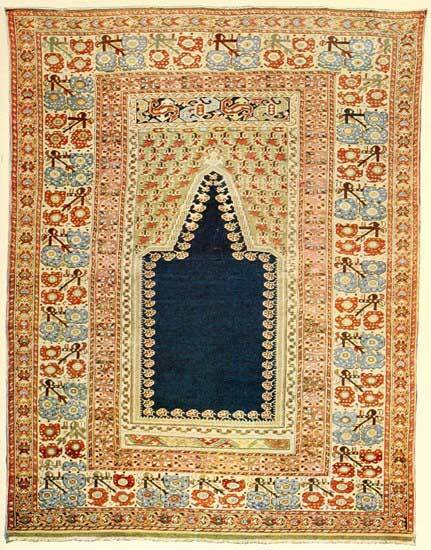 They came in the form of prayer rugs generally, and a pronounced feature of those more commonly seen is a multiplicity of small dotted borders. The older and finer examples show borderings of far more graceful and artistic drawing. 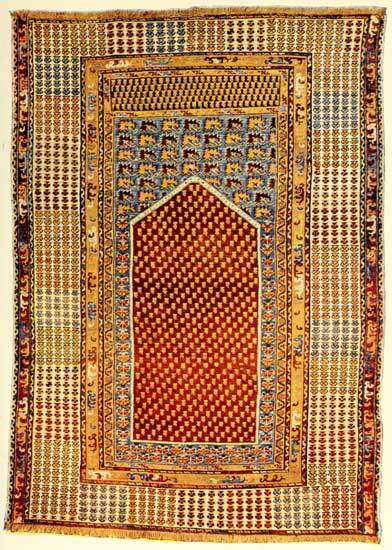 The antique Koulahs and Koniahs, though not so finely woven, have mostly the same superb centres or panels of solid colour as the Gheordez, and vie with the latter in the splendour of their hues, if not in the delicacy and intricacy of their designs outside the central field. The Koulahs may generally be recognized by a narrow border, which is peculiar to themselves and is almost invariably found on them. This consists of a broken line of little tendrils or spirals quite Chinese in character, and looking much like a row of conventionalized chips and shavings. It is so odd and distinctive that once seen it can never be mistaken. The Koniahs also have little figures which are quite their own, and which usually appear somewhere in the central design. They are small flowers each on a single stem, and the flower has commonly three triangular petals, like an oxalis or shamrock leaf. It is quite unlike the blossoms which besprinkle other rugs. With this, often come crude figures of lamps like miniature tea-pots. 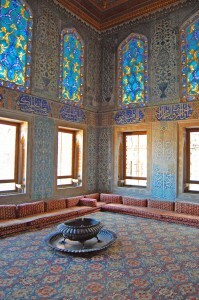 The Ladiks display all the colours of an October wood, and complete the group of Turkish old masters. Not a few of them have also a unique border in the form of a small lily blossom. Experts speak of it familiarly as the “Rhodian border,” but its origin is altogether obscure. These words in testimony to the beauties of Turkish rugs may be offered simply by way of guide-posts to lead to some museum. 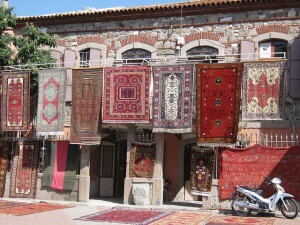 A few battered and torn war-flags of Gheordez or Ladiks are occasionally offered on the market, but the best of them lack all character and colour, and show only the bold design and holes and strings and naked warp. 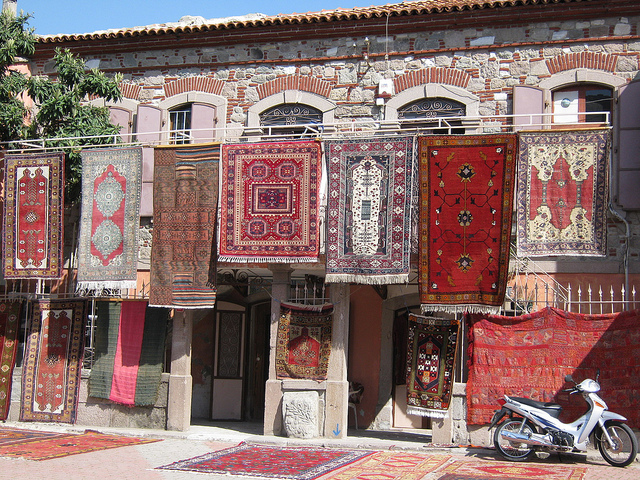 Just which particular Turkish rugs are properly classed as Anatolians it is hard to say, Anatolia being so large a province. The term as commercially used is only as comprehensive and expressive as “Iran” applied to the Persians. It is generally misapplied to an uncertain class of old, worn, and tarnished remnants or new coarse prayer rugs, ruinous of harmony with their magenta discords. Yet many of the “mats” are rightly called Anatolians, and, premising a later chapter, one of the greatest delights of collecting was to look[Pg 74] over a pile of them, with the never-failing hope of finding some bright particular gem. 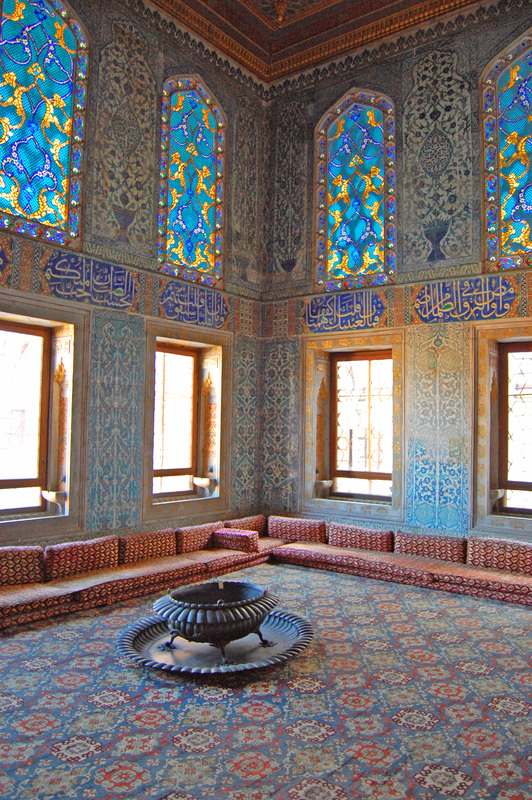 And these mats are truly the little gems of Turkish weaving, and in accordance with the Oriental fondness for jewels and precious stones the suggestion that they represent inlaid jewelled work has been well imagined. But here again we cry, “Eheu fugaces!” They have gone. It is idle to look over the pile. There are no good ones for sale. One explanation of their scarcity is in the fact that the Armenian dealers have a weakness for these small pieces themselves, and are wont to indulge their fondness for colour and sheen by keeping the choice ones for their own use. So the mats of commerce are either new, coarse, and crude and offensive with arsenical greens and aniline crimsons and magentas; or they are but soiled patches and bits of old rugs sewn together. Caveat emptor! and let the buyer look at their backs before purchasing. 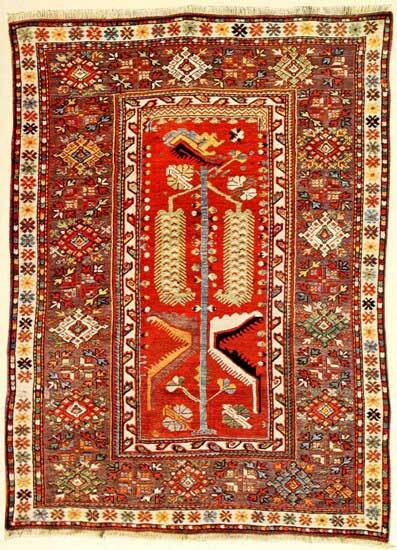 The old Melez rugs, with characteristics peculiar to themselves, are of almost like importance to the Koniahs and Koulahs. Frequently they have a suggestion of the Chinese in their figures and decorations. You will find symbolized dragons pictured on them, also the cypress tree; while in colour they form a class by themselves, and exhibit shades of lavender, heliotrope, and violet such as no other kinds may boast. Whatever this dye may be, and whatever tone of mauve or lilac it may take, you will find it only in the Melez, a few Bergamas, or in some old Irans, whose race is practically extinct. Worthy modern Melez are still to be had, and will improve as they wear; if only they are firm in texture and do not flaunt the battle-flag colours of Solferino and Magenta. The Bergamas come mostly in blues and reds, most prominently set out by soft ivory white. One of their recognized patterns is quite individual, and readily marks their class. It is a square of small squares marked off like a big checker-board. Other small pieces are almost square, with the field in mosaic-work or flower blossoms. In the fine old specimens, which used to be, the Bergamas rioted in superb medallions or in a floriated central figure like a grand bouquet. As a class, their merit is softness and richness. Their defect is that of the Shiraz, a proneness to curl and puff themselves with pride. The fault is caused by the fact that their usually artistic selvedge is too tightly drawn. Skilful cutting of the selvedge and new fringing will correct the error. Some old and some excellent new Bergamas have lately been in evidence in the stocks of the Oriental dealers. Howsoever or wheresoever they come, the collector may well take courage from their appearance and apply himself to the chase with renewed zest.